Apple's GCC on Mac OS X does not support the elf binary format. So compiling OpenBIOS on Mac OS X is not easy. Thankfully someone has already made a PowerPC cross compiler for Mac OS X that can compile OpenBIOS. Note: this tutorial was made with Mac OS 10.6. I suggest you use Mac OS 10.5 or higher when trying to build OpenBIOS. 2) Expand this bz2 file by double clicking on it. 3) Rename the file AWOS-CC to AWOS-CC.img. 4) Open the image file. 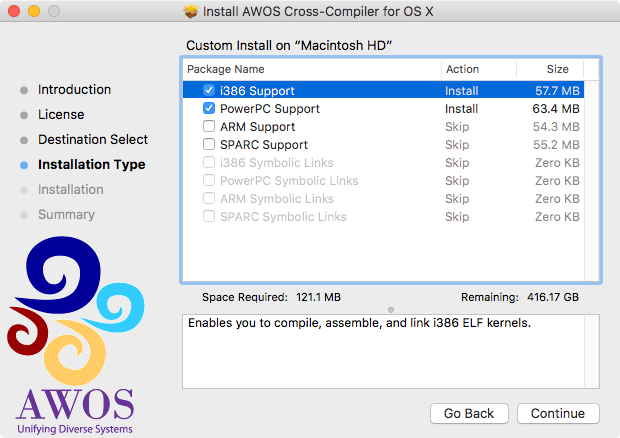 5) Open the "AWOS Cross-Compiler for OS X" file on the newly mounted disk. 6) Select the "PowerPC Support" and the "i386 Support" check boxes when given the option. 7) Continue with the installation until it is finished. Note: the above step will probably need to be repeated with each new session of the shell you start. It can be made permanent by altering the .bash_profile file for the Bash shell. It is located in your home folder. Then simply paste the export commands in this file. Save changes when you are done. ppc-elf-gcc (GCC) 4.2.3 Copyright (C) 2007 Free Software Foundation, Inc. This is free software; see the source for copying conditions. There is NO warranty; not even for MERCHANTABILITY or FITNESS FOR A PARTICULAR PURPOSE. This should conclude installing the compiler. 1) Open the Terminal application. 2) Change the current directory to the inside of the openbios-devel folder. 3) Open the file makefile.target and add a # in front of this text "CFLAGS+= -Werror". Save the changes when done. This tutorial was made using information available on 12/21/2017. If you encounter any problems, please report it to the openbios developer list: openbios@openbios.org. This page was last modified on 22 December 2017, at 00:28.